I’ve wanted to try this classic recipe for a while now. I finally did tonight! This is the original recipe from James Beard, published in NY Times a few years ago. The recipe calls for 40 cloves of garlic, and yes, I’m a huge garlic lover. Funny though, this dish wasn’t extremely garlicky. Surprisingly, actually. There have been many many adaptations, some of which include versions by Ina Garten and Alton Brown. If fact, if you Google “garlic 40 cloves chicken”, the James Beard recipe doesn’t even appear on the first page – at least at this time anyway. 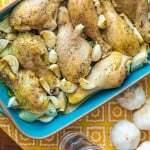 The original version of this dish calls for unpeeled garlic cloves and for the chicken to cook covered in foil for 90 minutes. I was concerned for two reasons: one, I wondered how the chicken would appear if it cooked without the opportunity to brown (since it wasn’t directly exposed to the heat at all). My other concern was if I’d be able to taste the garlic since the garlic remains unpeeled and uncut. I made a few minor changes to the recipe. First, I reduced all ingredients, except for the garlic, to half because we could not possibly eat 16 pieces of chicken. The other changes I made were to omit the nutmeg (I didn’t have any) and to skin the chicken because I was very afraid of the skin being rubbery. However, bear in mind that keeping the skin on is supposed to increase moistness. Actually, I left one piece with the skin on. Can you tell which one it is in the photo above? The smell coming from the oven was fantastic, a good sign, and I’m happy to say that the chicken came out very moist. The garlic was softened and popped right out the peel, making it perfect to spread on a piece of sliced bread (the roasted garlic is something that is missed in a few of the more modern versions; many other versions use peeled garlic). My daughter and I enjoyed it very much, but my husband only gave 2 out of 5 stars:( His disappointment, curiously enough, was that he couldn’t taste the garlic. Ha! Pour oil into large bowl, and toss drumsticks to coat. 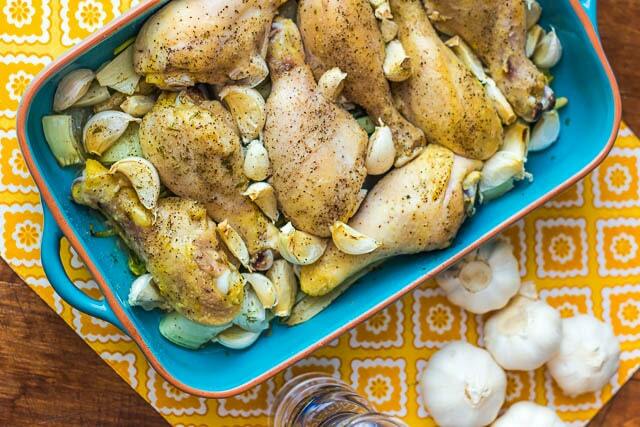 Place chicken drums in casserole on top of vegetables and tuck garlic all around. comparable one is Jamie’s Sunday Chicken. Oh, I’ll have to try the Sunday Chicken – thanks! With 40 cloves of garlic, your husband couldn’t taste it?! 🙂 Thank you for sharing this . . I’ve wanted to try this recipe too!! Now, I can’t wait! I’ve always wanted to try 40 clove garlic chicken. My hubs would probably want more garlic too.